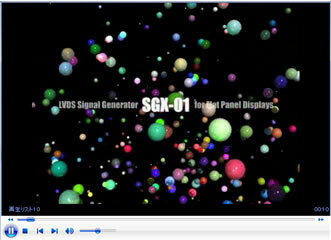 The SGX-01 is a signal generator to drive LCD panels with LVDS input for high vision and FULL HD systems. Test images are created and displayed using test pattern data memorized in a flash memory integrated to the remote controller. If you still cannot watch the video, please accept our apology. Then, please e-mail us at with your mail address and preference of NTSC or PAL (broadcasting system of your country). We will send you a DVD upon receipt of your e-mail. Dot clock frequencies can go up to 135MHz in single link and 270MHz (135MHz x 2) in dual link. *The frequencies optionally can go up to 540MHz in quad link. Time period taken for changeover of LCD panels can be reduced by updating software of a micro computer and FPGA in the SGX-01. Signal pattern data for each panel type can be edited with an external PC. Such test patterns can be updated by transmitting to the flash memory in the remote controller. A rectangular marker can be displayed on LCD panels using the coordinate information about screen defects obtained from automatic tests in the front-end process, which reduces cycle time taken for visual inspections. A cross-line cursor can be displayed on LCD panels to move to any position. Vertical and horizontal scrolling on a screen can be made to any position. In addition, automatic scrolling can be done by programmed a motion speed. Up to 32 alpha-numeric letters can be shown on LCD panels to display evaluations in a test process. The SGX-01 corresponds with EDID data system, which enables acquiring information about panels when a PC monitor is connected.